The story of Madyson’s Marshmallows began when 4 year old Madyson asked how to make a marshmallow. Madyson and her dad started blending and mixing up different recipes together in their small home kitchen. Turns out, their marshmallows were delicious! Soon enough, they hit the road exhibiting at local craft fairs on the weekends and as they say, the rest is history. From a child’s sweet curiosity, a small family owned and operated company was born. 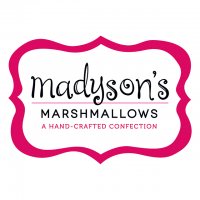 Today, you can find Madyson’s Marshmallows in both national retail locations as well as smaller specialty markets and boutiques. Madyson’s Marshmallows are produced in a dedicated marshmallow factory, using all natural, kosher ingredients without preservatives. Many of Madyson’s Marshmallows are certified Kosher.